DATE/TIME: November 25, 2018	12:30 a.m.
On November 25, 2018, shortly after midnight, Deputies were dispatched to a call of a reported vehicle burglary in the 1200 block of Crafton Ave in Mentone. While investigating the burglary, dispatch received another call from a witness who was following the suspect vehicle. The witness was in Highland and deputies from the Highland Station received the information. According to the witness, the suspect vehicle pulled over to the side of the road near the intersection of Garnet Avenue and Highway 38 while he was following. The witness approached the vehicle to confront the suspects and an unidentified male leaned out of the passenger window with a pistol and fired the weapon. The witness was not hit. The suspect vehicle fled the scene and drove into Highland. Highland deputies located the vehicle unoccupied and conducted an area check for the occupants. A short time later, the registered owner, Veronica Contreras, was located and provided a false name. Her true identity was discovered and she was found to have a felony, no bail out-of-county warrant. There was property in the vehicle matching that described as being taken in the initial vehicle burglary. The witness identified the vehicle in the Highland investigation as the same vehicle he saw leaving the scene of the burglary, and in the shooting. Property located inside the vehicle matched the property reported stolen in three separate vehicle burglaries in the Mentone area, two of which weren’t discovered until the following morning. All victims were contacted as part of the investigation and their property identified and returned to them. Contreras was booked at Central Detention Center for vehicle burglary, possession of stolen property and for a no-bail warrant. Investigation is continuing into the identity of the other suspects. 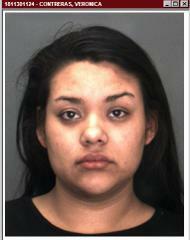 Contreras was not cooperative with investigators and is not known to have any ties to the Yucaipa or Mentone area. Her booking photograph is being released in hopes the public can help link investigators to any homes or associates she may have in the area.